Definition at line 395 of file AliasAnalysisEvaluator.cpp. 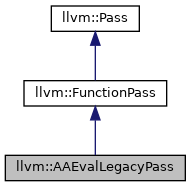 Definition at line 400 of file AliasAnalysisEvaluator.cpp. Definition at line 418 of file AliasAnalysisEvaluator.cpp. 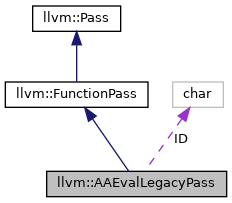 References ID, INITIALIZE_PASS_BEGIN(), and INITIALIZE_PASS_DEPENDENCY. Definition at line 409 of file AliasAnalysisEvaluator.cpp. Definition at line 404 of file AliasAnalysisEvaluator.cpp. Definition at line 414 of file AliasAnalysisEvaluator.cpp. Definition at line 399 of file AliasAnalysisEvaluator.cpp.